The event often called, 'the Feeding of the 5,000' from 5 loaves and two fish is the only miracle (apart from the Resurrection) which is recorded in all four canonical Gospels: Matthew 14:13-21, Mark 6:31-44, Luke 9:10-17 and John 6:5-15. In his homilies, Pope Francis has emphasised the sharing in this miracle more than the multiplication. If we only believe and share what we have, we can work such miracles. In South Sudan, we have a modern day version of this. I witnessed this last week. There is a huge food crisis in South Sudan. Many people are hungry. 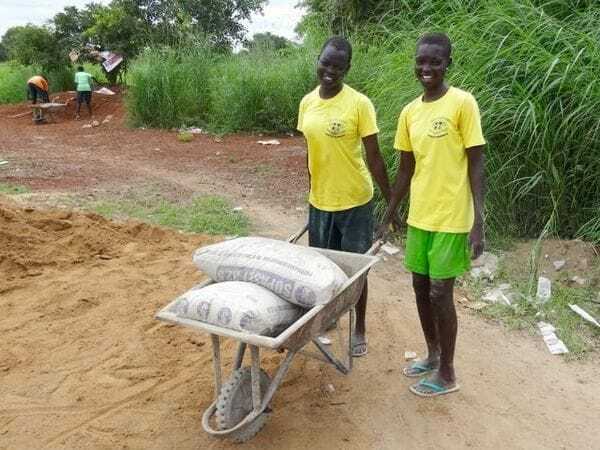 Yet, against all the odds, Loreto Rumbek has been feeding many people each day. Loreto is a school, a very good school, not an agricultural project. I am proud to be the chair of the College Board because it is a school that is making a huge impact with the quality education it delivers. Actually it is two schools: a day primary school for 542 boys and girls; and a secondary boarding school for 201 girls. Loreto also offers an Accelerated Learning Programme (ALP) for 146 of the local people, a mixture of adults and children who have missed out on the opportunity for formal education. Over the past few months, food prices have risen dramatically and it has become increasingly difficult to access food. It was obvious to the Loreto Principal, Sr Orla, and her staff, that many of the local people were very hungry and that students returning to school were reporting very little, if any, food at home. With the aid of a young Mennonite volunteer, Ben, who writes very good submissions, Loreto approached several donor groups who agreed to provide funding for food relief. But the decision at Loreto was that it could do better than just feed the students, especially the boarders entrusted to their full-time care. Loreto set about employing between 30 and 80 people each day to cultivate, plant, weed and harvest various food crops plus cooks, of course. They grew food, their wages injected cash into the markets and the local economy began to function much better. Even more importantly, the people enjoy the dignity of working for their upkeep and helping the schooling of their children rather than having to beg for aid. Along with the students in all three educational programmes, Loreto undertook to feed 60 teaching staff and all other employees, including the agricultural workers and block-makers. Yes, in an enterprising initiative, Loreto is making its own concrete blocks for future construction. Fifteen Senior 4 girls stayed back this vacation period to follow a 'masonary programme'. In the first day they made 300 blocks, 50 more than the men has made! Altogether, Loreto undertook to feed just on 1,000 people per day. Somehow, almost miraculously, they managed to grow and buy enough food to do this. Recently a Loreto Sister, Sr Penina from Kenya, a qualified nurse, has joined the Loreto community. She has brought health care to all the students, the workers and their families. Penina is assisted in the clinic by a few local women and some Loreto graduates. They care daily for many patients. The incredible impact of better access to health care plus nutritious, basic meals for the students has seen the attendance rate soar to 95%. The class attendance rate of the Loreto boarders has risen to 100%. One primary student wrote: "I am very happy to come to school. Sometimes I come hungry, there is no food at home. When I come to school we eat lunch every day. The food keeps us strong and helps us to concentrate in class without being disturbed by hunger. When we go home we don't disturb our mothers looking for food, because it isn't there and we have already eaten in school". A mother said: "I can see the difference between our kids and the kids from other schools. Ours are happier and have more energy for learning. They are able to learn and concentrate on their studies". Yet another said: "We are very grateful for the support we have received in the form of food. Without this support most of us were going to starve". One of the cooks said: "The food we eat give us energy so that we can cook for the children. Since the shortage of food in June most of us depend on the food that we get in Loreto. We can see that the children are very happy every day when they come for their lunch". With faith and determination, Loreto has used its resources to help the local community as well as the school students. On only one day was there not enough food for the workers. At times, it seemed the food would run out but somehow enough was found. I say a modern 'miracle' in South Sudan.